The founder and owner of a National Pro Fastpitch (NPF) league team that was ousted two years in is under renewed scrutiny for allegedly leveraging his leadership role at a nonprofit Houston museum to gain funding for the team and a new league. NPF sued Joel Bartsch, owner of the league’s former Scrap Yard Dawgs, in January 2018 over issues with leaving the league, renaming the team as an independent and intending to start a competing league. The filings in the lawsuit, revealed in a report Wednesday by ESPN’s Outside the Lines, allege that he abused his position as the head of the Houston Museum of Natural Science to fund the sport’s first $1 million contract and his effort to begin a new softball league under the purview of USA Softball. The allegations involve museum work given to his friend and renowned museum designer, Paul Bernhard, in return for payments to softball-related organizations and entities Bernhard knew nothing of. Attorneys have denied any wrongdoing by Bartsch and told ESPN that the league is now “merely harassing” his client. Who are Joel Bartsch and Paul Bernhard? Bartsch has worked at the Houston Museum of Natural Science, a nonprofit, in some capacity since 1984, when he started as a security guard, per his museum bio. In 2004 he was appointed president and CEO. His bio details the $85 million capital campaign he began that resulted in a 204,000-square-foot addition opened in 2012. His longtime friend, Bernhard, is the principal partner and content team lead for Paul Bernhard Exhibit Design and & Consulting (PBE). Per his company bio he has worked with organizations and museums around the world. On a 2016 IRS filing by the museum, obtained by ESPN, Bernhard received $18 million in business and was the highest-paid contractor by the museum. Though a board chairman for the museum said in a deposition he was not aware of the board approving a contract with the business. Bernhard is not involved in the lawsuit, but was deposed as part of it, per the report. “That friendship is separate and apart from any professional dealings of the Museum," Bartsch wrote in an email sent by an attorney with the firm representing both Bartsch and Bernhard. The same law firm also represented the museum and its board chairman during depositions. What about the Scrap Yard Dawgs? Bartsch, 57, first owned the Texas Charge in the NPF; it was dismantled in 2017, per Flo Softball. He founded the Scrap Yard Dawgs in 2015 out of Houston and seven months later made headlines by signing star pitcher Monica Abbott to an unprecedented $1 million contract ahead of the team’s first season. That spurred a lawsuit that alleges Bartsch violated a non-compete agreement, which led to details about Bartsch’s funding methods. NFP is alleging a “quid pro quo” between Bartsch and Bernhard, who in turn said they “do business together as friends, on trust, on a handshake,” per the February 2019 court filings obtained by ESPN’s Outside the Lines. The league alleges that Bartsch gives Bernhard multi-million contracts for museum work in return for donations that settled debts to the NFP and were meant to fund a new league with USA Softball. Per ESPN’s Outside the Lines report, Bernhard said in a deposition that his firm was paid $31 million for a 30,000-square-foot wing at the museum that opened in fall 2017. Part of that is likely the $18 million filed on the 2016 tax forms. 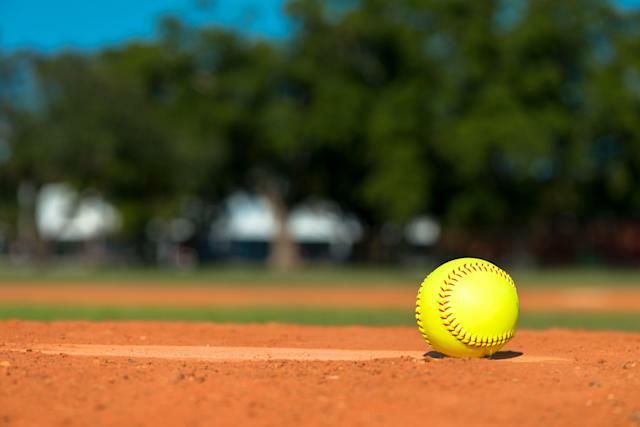 He also said he provided up to $9 million to softball organizations between 2013 and 2016 upon the request of Bartsch, even though he knew nothing about the sport, the recipients or how the money would be used. An American Express account belonging to Bernhard that the NPF included in its letters to the state attorney general indicates the depth of their “friendship.” Bartsch; his daughter, Caitlin; and Scrap Yard Dawgs general manager Connie May had unrestricted use of the account. Bernhard, per ESPN, said he paid the bills that accrued up to $1 to $2 million a year. Transactions gone over by ESPN include a $250,000 donation by Bernhard to USA Softball in September 2017. USA Softball executive director Craig Cress said under oath Bartsch wanted half of the money set aside to start a professional league under the organization’s umbrella, per filings. The money, Cress said, was returned when the idea did not move forward. USA Softball eventually moved entirely out of the situation upon word of the lawsuit, per ESPN. “[Softball's] national governing body was plotting and planning to undermine the only professional level of this sport that exists in this country. We were celebrating our 15th year last year," NPF commissioner Cheri Kempf told ESPN, for whom she also works as a seasonal employee. "It was a complete and utter shock to find out they were involved, and especially to the degree that they were involved." The NPF was founded in 2004 as a revival of the Women’s Pro Softball League, which ran from 1997 to 2001. It is an official development partner of the MLB and consists of six teams in 2019. The season set to open during Memorial Day weekend. The sport itself is growing, an aspect that will give the NPF a boost if the league can leverage it correctly and if media entities sign on as they have for the NCAA level. Per a Softball America story last month, softball brings in the fourth-most revenue at the NCAA level and is growing at a rate faster than any other (217.4 percent over 13 years). Its TV ratings are beating out other sports in the same time slots. Women’s hockey is facing the same situation Kempf wants to avoid, hence the initial lawsuit. The fact that the sport has two women’s professional leagues in North America has dominated headlines in recent months and even years as the leagues figure out how to proceed forward in the best interest of the game.